It was probably because he suffered terrible ill health as a child, that the main focus of Truby King’s professional life was the pursuit of ‘sound health’. Whether it was the health of his cows or his patients at Seacliff, or the women and children of the wider Dunedin community, King continuously investigated ways to improve living conditions and nutrition. This volume is one of many of King’s that he annotated. If he agreed with certain passages, they would be given a ‘tick’; if he did not agree, the passage might receive a cross, often in blue or red pencil. Sometimes he would write his own paragraph, contradicting the author, in the margin. There is no doubt that Truby agreed with the underlined sentences above, as they all receive his ‘tick of approval’. 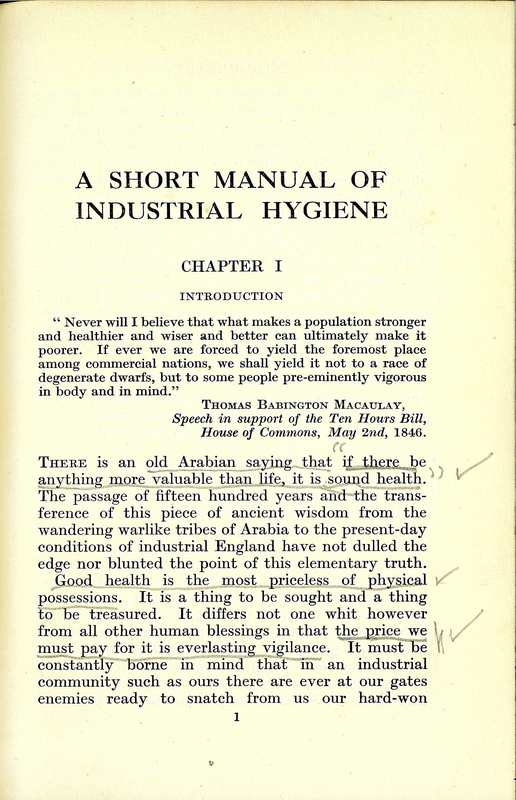 Leonard P. Lockhart, “A Short Manual of Industrial Hygiene,” ourheritage.ac.nz | OUR Heritage, accessed April 20, 2019, http://ourheritage.ac.nz/items/show/11212.